Ensure the Extension is ON and complete any necessary connection and listing details presented for that Listing Agent. Verify the Listing Agent has been added correctly by viewing it in the Auction dropdown selection box on the Export Tab of any vehicle. If your preferred Listing Agent is not displayed here it has either not been added correctly or your nominated Listing Agent does not allow automated adding of Auctions from Motorcentral. Select the Listing Agent you'd like to export this vehicle as an auction to, and also the Start Price, Reserve Price and Buy Now Price (if applicable). Note: you may only export a vehicle to one Listing Agent at a time. Save & Close the vehicle. Success fees are charged by Trade Me on auctions where the highest bid is equal to or above the reserve price or the item is purchased by Buy Now. For more information about Trade Me fees please visit the Trade Me website. 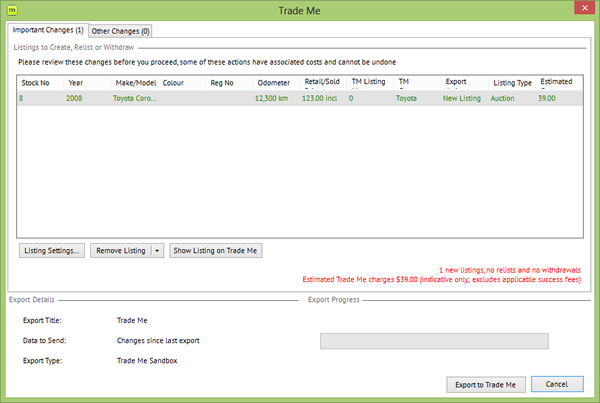 Select the Admin tab and verify the vehicles you wish to export to Trade Me are listed in the Export Vehicles section. You will also need to verify each vehicle has a Trade Me category allocated to it. 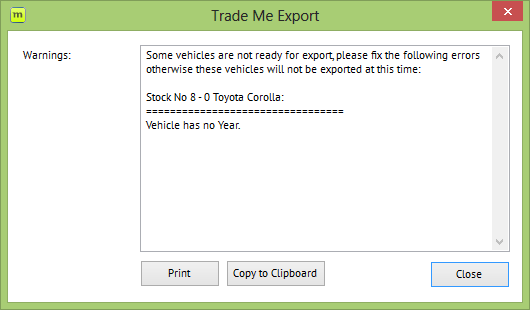 Select any Export options you wish to include when exporting your vehicles to Trade Me. Note: Selecting to Export Consumer Information Notice and Vehicle Summary Sheet will append these items as photos to your other vehicle photos. If the total number of photos exceeds 20 then these will replace your last vehicle photos. Click the Export Now button to initiate the Export process. Motorcentral will next verify that the vehicles you intend to export comply with any Trade Me listing requirements. If any vehicles fail to comply you will be presented with a warning dialog and how to correct these vehicles. Note: Any vehicles not complying will not export. Although not absolutely necessary to complete an Export we advise correcting any vehicles before proceeding. Next you will be presented with the vehicles that need to be exported to Trade Me (Important Changes & Other Changes). If a vehicle has not changed since it was last exported to Trade Me it will not be displayed in this area as no updates will be sent to Trade Me as part of this export. 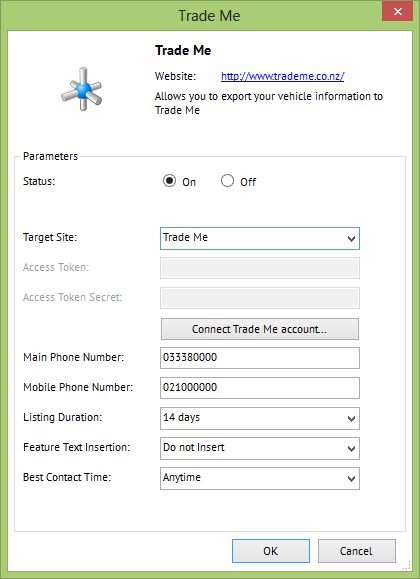 If a vehicle is listed but you do not wish to update or export it to Trade Me then you can remove it by highlighting the vehicle in the list and clicking the Remove Listing button. You can Remove the Vehicle just for this export or permanently which will stop exporting any changes about this vehicle going forward. Note: Removing a vehicle permanently does not remove it from Trade Me. Once you are satisfied the vehicle listings are correct click the Export to Trade Me button to export your vehicles.